Béziers, a Greek city of the sixth century BC is the oldest city in France. Fortified and endowed with beautiful Haussmann buildings, it overlooks the Orb and the Canal du Midi, built by a child of the city: Pierre Paul Riquet. Surrounded by the largest vineyard in the world, Béziers claims its pleasure from rugby and bullfighting. Its geographical location, between the sea and the mountains, makes it a popular place. Thibaud purchased the very old boutique located in the heart of the city at 18 avenue Georges Clémenceau early in 2013. Very attentive and in love with eyeglasses, he totally invests in his trade. 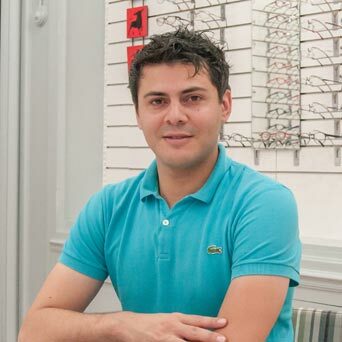 He regularly lets his customers discover new collections, takes the time to explain everything about eyesight, he is an example of what awaits anyone who wears eyeglasses : patience and passion. His youth is an asset when it is necessary to give an opinion, both technical and aesthetic. He has full confidence in Essilor, a French company and world leader in corrective lenses. Subtle and architectural, this Kuboraum frame is a superposition of shapes. Fitted with Nikon lenses P. Master Infinite 12 1,5 Blue Secure SCC+UV, it gives you an optimal visual comfort and will be the ideal companion whatever your activity. Do you need to renew your contact lenses, or get some information about our new collections ? Feel free to contact me via this form.